Son Heung-Min’s South Korea face a tough run to the final of the competition after failing to top their group. SON HEUNG-MIN has warned South Korea face a tough run to the Asian Games final after failing to top their group, as he bids for a gold that could save his career from being derailed by military service. Son’s volley in a 1-0 win against Kyrgyzstan fired his team into the last 16 of the regional Olympics on Monday, setting up a clash with fellow heavyweights Iran — the tournament’s top-ranked team. Nothing less than gold will be enough to exempt Son, 26, from his 21-month compulsory military service, and he warned his young team-mates they will need to be more clinical in front of goal. “The Iran team are very strong. We need to prepare very well,” said Son. “We are all professional players, so I think they should learn by themselves — I don’t think I need to say anything to them. South Korea finished second in their group after a shock loss to Malaysia. Victory against Iran on Thursday would likely see South Korea face a highly rated Uzbekistan side in the quarter-finals. 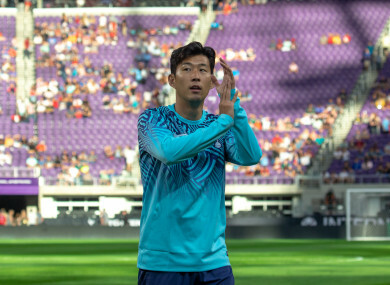 Son is playing at the Asian Games after being granted special permission by Spurs, with whom he signed a new, five-year contract last month. He is one of three wild cards — players aged over 23 — selected to play in the U23 tournament. Iran’s senior team are Asia’s top-ranked side, standing at 33 in Fifa’s rankings, and impressed in a tough World Cup group featuring Spain and Portugal. Uzbekistan, who won Asian Games gold in 1994, have a promising young crop of players coming through, and won every group game without conceding a single goal. South Korea coach Kim Hak-bum echoed his star forward’s warnings, describing Iran as “quite powerful”. “Every match could be our last match,” said Kim. Email “Tottenham star bidding to avoid military service with gold at Asian Games”. Feedback on “Tottenham star bidding to avoid military service with gold at Asian Games”.